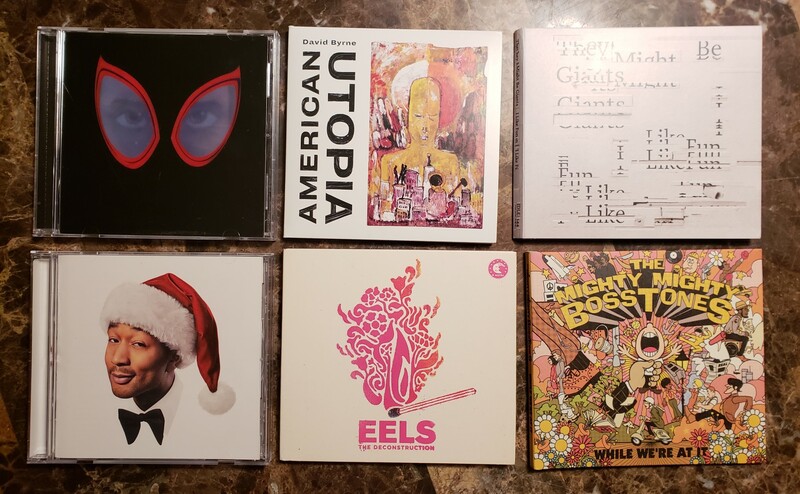 Best CDs of 2018 According to an Old Guy Who Bought 6 « Midlife Crisis Crossover! Pretty sure that paltry number still puts me in the upper 10% of American physical media shoppers. It’s that time again! The annual entry where I look back at the previous year as one of seven people nationwide who still prefers compact discs to digital. I’d probably also count myself among the trendier listeners still collecting vinyl if my last record player hadn’t given up the ghost about twenty years ago. I don’t splurge too much because it’s increasingly tougher for new music to catch my ear as I grow older and more finicky, and as my favorite acts of yesteryear die, stop recording, or turn toward musical directions that take them beyond my zones of interest. That usually means missing out on what the majority loves, thus further dragging me down the long plummet into total irrelevance. The following list, then, comprises every CD I acquired in 2018 that was also released in 2018. On with the countdown in all its lack of diversity, from the kinda-not-for-me to the unexpectedly inspirational. 6. Various Artists, Spider-Man: Into the Spider-Verse (Soundtrack from and Inspired by the Motion Picture). Still juiced up after catching my favorite film of 2018, I thought the next logical step was picking up the soundtrack as a tangible souvenir of the experience. This medley of young rappers for young audiences is an instructive catch-up course on the current state of multicultural electronic beats and producer-driven soundscapes, but filled with the voices of so, so many strangers. (I’d heard of Jaden Smith and Vince Staples, though I’m old enough that I somehow frequently confuse Vince Staples’ name with Vince Gill’s.) Most of the MCs here are younger than my son, several of them doing that old-school thing where their soundtrack lyrics embrace their film too literally and leave me chuckling for the wrong reasons. And for a film whose Moral of the Story is that anyone can be a hero, it’s a jarring juxtaposition that 11½ out of 12 songs sport all-male vocalists, leaving Nicki Minaj to represent like a lone Spider-Gwen on the back end of “Familia”. Sample tune: the end-credits slam-dunker “Elevate” by DJ Khalil and four credited MCs — I have no idea who did what — which dominated the end credits and was the main reason I bought this in the first place. Honestly, I was hoping there’d be more like this one. Honorable mention goes to the angrily funky “Start a Riot” by Duckwrth & Shaboozey, which would be a cool name for a Disney-animated detective agency. 5. They Might Be Giants, I Like Fun. One drawback to an awesome band that dabbles in every possible song styling is that it’s nearly impossible to chart any sort of ups or downs over the course of albums. All you can say is here’s another collection of largely bright tunes that share little common ground save tunesmithing quality. Their penchant for choosing totally original, inimitable song titles continues with offerings like “An Insult to Fact Checkers” and “All Time What”. Also still going is their apparent quest to fit every word in Webster’s Dictionary into a lyric before they die, with new vocabulary words you’ll never hear in a Top-40 hit such as “dessicated” and “tungsten” and “doodlebug”, not to mention the first mention of a clambake since Elvis. If you liked the themes to Malcolm in the Middle or Higglytown Heroes, or that time the two Johns were on Tiny Toon Adventures, here’s more of that infectiousness. And just to put too fine a point on how the band’s obsessively atemporal nature makes for a paradoxically repetitive experience: 80% of the preceding paragraph was recycled from my capsule review of their 2016 album Phone Power. Sample tune: I hate choosing the first song on the album because it makes me look like I didn’t listen to the rest of it, but in this case “Let’s Get This Over With” leads off with jazzy piano frolicking atop a snappy Marty Beller backbeat and has the only chorus I found myself humming after I put the CD back in the case. 4. David Byrne, American Utopia. The first new solo album in fourteen years from That Guy From Talking Heads expects your skepticism of its lofty title in his liner-notes essay: “Is this meant ironically? Do I mean this seriously?” Inspired in part by the seemingly dismal state of “the American experiment”, Byrne’s reawakening voice sounds shaky in spots from years of disuse and/or uncontrolled aging, but he enlists some choice collaborators for his journey. Eight of the ten songs were co-written with old friend Brian Eno, the other two with Daniel Lopatin, a.k.a. electronica act Oneohtrix Point Never (yeah, I had to look him up), and one of the album’s producers is longtime They Might Be Giants overseer Pat Dillett. Simpler, slower, and a little sparser than the “world beat” direction Byrne took after the Heads broke up thirty years ago, the results remind me of David Bowie’s Blackstar — it’s not a comeback and it’s not the music of right-here-right-now, but it means a lot to him and feels more rewarding if you’re patient and curious to glean where he’s coming from. Sample tune: “Every Day is a Miracle” is the most ribald but also the most return-to-form, recasting today’s inter-demographic fistfights as dismal children’s storybooks, albeit with a hope of transcending those trappings and terraforming all those virtual acres of post-flame-war wastelands back into common ground. A plaintive, wishful melody for quixotic dreamers of all ages. 3. Eels, The Deconstruction. I still hate albums made entirely of slow songs, which tends to be the oeuvre of choice for aging musicians for the rest of their lives after their eardrums become too tender and high BPMs become too exhausting. Thankfully Mark Everett isn’t that old yet, either. As with the better Eels albums of old, his raspy melancholy holds a peculiar allure for the ponderous introverted listener even on low-speed settings, but interspersed between those musings are a few interludes of deceptively jaunty ditties that could pass for pop summer singles if that was a thing he cared about anymore. As with Byrne’s Utopia, Deconstruction isn’t a radical reinvention but one artist’s reaction to What Things Have Become, wondering aloud where and how we go from here. If you’ve bought every Eels album ever, it might feel more repetitive to you than it does to me, because I didn’t realize he was still recording. His four-year break was shorter than Byrne’s, but for me it was nevertheless cool to hear from him again. Sample tune: the positive vibes of “Today is the Day” are a virtual tonal clone of “Hey Man (Now You’re Really Living)”, but I’m not yet tired of narrators rejoicing in their realization that they’ve gone off the rails and that a little change might do them some good. Not that Everett’s changed much musically in 20+ years of recording, but you get what I mean. 2. John Legend, A Legendary Christmas. Good luck finding an accredited music critic who gives holiday albums any serious consideration. Advantage: undisciplined amateurs like me. I missed the tie-in TV variety special, but Legend’s fresh takes on olde-tyme carols and his covers of other musicians’ attempts at modernizing Christmas kept popping up on SiriusXM’s main Christmas channel and sold me on this merry collection. “Merry Christmas Baby” sounds improper with all the blues drained out of it, but I couldn’t help bouncing and singing along to his disco-friendly “Silver Bells” and the New Orleans jazz of the finale “Merry Merry Christmas”, one of several Legend originals that work where other wannabe Top-40 Christmas co-opters falter. Odes to that all-important baby in the manger haven’t grooved like this in years. Sample tune: if I’m required by music-writing law to include at least one slow song in this entry, the winner is “By Christmas Eve“, in which Our Hero is stuck in L.A. and valiantly promising his wife Chrissy Teigen that he will totally be there in time to open presents by the tree with the kids. There’s something about happy loving spouses fiercely committing to love and family that really speaks to me in a pop-culture world where marriages real and fictional tend to end prematurely either in death or in two-timing, pigheaded sin. But what got my attention most this year wasn’t anything on the record — as fine an assembly as any other Bosstones joint, mind you. It was the continuing presence of Ben Carr, one of three remaining co-founders who’s not a musician per se. Officially he’s their tour manager, but when they play live, he’s their one-man dance troupe. He was easy to overlook in their older videos (“Someday I Suppose“) but over time moved to the forefront as fans came to accept him as part of the Bosstones experience (notice his starring role in “So Sad to Say“). In their formative years he was too young to legally enter some of the clubs they played; three decades later he’s still around, still a Bosstone, and, at their Indy show, older than me but still up on that stage bopping and skanking and getting down with his bad self. Meanwhile there I am hanging out on the dance floor — not because I dance (at all), but because asking strangers if I can sit with them is even greater anathema to me — feeling grumpy and lumbering and achy and in everyone’s way, but watching this guy who’s clearly my elder not letting anything like that drag him down. For the space of that night I didn’t feel alone, and now While We’re at It is a wild, snappy memento of that encouraging moment of liberation. Sample tune: “A Wonderful Day for the Race” is this list’s one last happy-to-be-alive shot of optimism, less cautious than either Byrne or Everett, encapsulated by that moment of silence after the bridge (the point in the live rendition where the guys all “took a knee”) broken when Lawrence Katz’s triumphant guitar kicks in and leads the headlong rush all the way home. …so that’s the limited scope of my 2018 in musical purchases, then. See you next year, assuming I don’t quit new music and limit myself to ’80s pop-radio recycling like too many of my over-40 classmates!